"Understanding Columbus requires more than just knowing about his maritime record. It means going back to his world; not the ports of Lisbon, nor the courts of Castile, but Genoa, circa 1451-2, the given time of his birth. He was not born with a map in hand and an idea of the New World. Rather, he was the product of a time and a place; a small but significant Ligurian port which sits in the shadow of the Apennine mountains. At first, Genoa appears a simple city. But a closer look reveals a self-contained world, cut off from the rest of the Italian peninsula, with only the sea as an exit. Its cramped streets accelerate into an ever-increasing jumble as they near the docks, with only the coming and going of ships providing an outlet into the wider world. "Like its rivals Venice and Pisa, Genoa had prospered during the Crusades, when the Christian soldiers in the Middle East established trade agreements with those ports, using them to their advantage, not only to launch ships and move troops, but also to trade goods with the markets in the Levant. This line of commerce proved lucrative, and soon these city-states grew very wealthy. However, the waters were awash with Muslim ships and pirates ready to plunder, and despite their growing disputes -- Genoa, Pisa, and Venice often fought among themselves -- these cities were united in the effort to repel them. In these and earlier times, Islam had dominated Mediterranean trade. Muslim sailors had more advanced navigation techniques than Christians, and from the eighth century their piracy was also striking terror into Europeans on sea and land. Their technical prowess and ruthlessness made them a constant worry. "Trade was not only to the Levant, though, and despite the religious animosity, Genoa often made commercial transactions with ports along the coast of North Africa. Venice, in contrast, looked more to the East and became more enmeshed with Byzantium. The East was known as the land of riches, and luxury goods such as silks and spices came up to Europe along the Silk Road, though often in very limited supply, thus commanding the high prices which made them available only to the wealthy. "Although Genoa did not have the same access as Venice to the riches of the East, it prospered and soon became not only a centre for the distribution of goods and the circulation of currency, but also -- its tangled streets full of sailors and tall tales -- an important place for map-makers, shipbuilders, and adventurers. Perhaps one of the most significant sailors to wash up in Genoa was Marco Polo. The thirteenth-century Venetian explorer had been thrown in a Genoese prison after being captured in a naval battle between the two city-states. ... [Marco Polo's] tales whetted the appetites of sailors and merchants keen to find an easier route to these treasures. Columbus would have read Polo at some point as his tales were still circulating many decades later. But even putting Polo's stories aside, Genoa would have provided a cosmopolitan hothouse for the young and ambitious Columbus. "By the time of Columbus's birth, Genoa's fortunes were waning somewhat. ... The rhythms of trade were also changing. While Genoa and Venice had been active in commerce with the Crusader states, there was a shifting to the north as Catalan ships sailed to Flemish or even English waters, searching for goods such as wool. 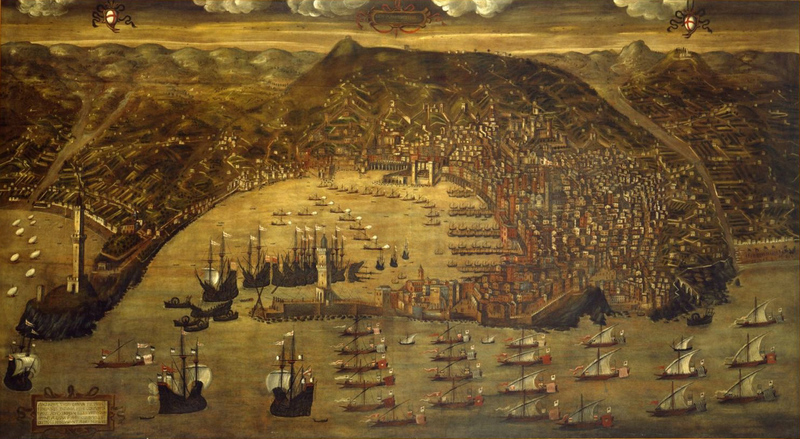 ... By the time Columbus decided to go to Lisbon, Genoa was not quite the beacon of commerce it had been, but there is no doubt its history left a deep impression -- the bustle of the port, the lure of wealth, the normality of slavery, the taste of sugar -- on its most famous son's earliest years."